Catholics get a bad reputation for not reading the Bible, and while it isn’t entirely untrue, we Catholics could do a better job of reading, knowing, and studying the Bible. One of mine, and many other Catholics favorite Bibles has been the Ignatius Catholic Study Bible. It is a great gift to the English speaking Church, but unfortunately, it is only the New Testament. Old Testament books are being churned out (slower than some of us would like), but until the Ignatius Catholic Study Bible’s completion, people like myself have been using editions like the New American Bible Revised Edition (NABRE) for their Old Testament readings and study. That was until the release of The Didache Bible! 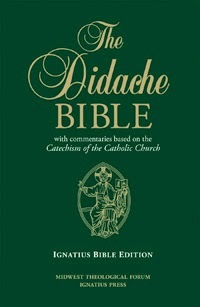 For the same price as the hardcover Ignatius Catholic Study Bible, you can get The Didache Bible, which contains both Old and New Testament. But what else makes this Bible special? I’m glad you asked! Other great features in The Didache Bible include full page apologetical explanations on topics such as Baptism, Mortal and Venial Sin, and Apostolic Succession, just to name a few. There is a brief glossary (if you consider 43 pages brief) and topical index at the end of the Bible, and there are also 27 full-color Biblical maps which include Old Testament maps (like The Journeys of Abraham) and New Testament maps (like Christ’s Journey to Jerusalem). The size of the Bible is 6″ x 9″, with a font of 9.5 points. Both of these are smaller than the Ignatius Catholic Study Bible, but the font was not a strain on my eyes to read. It is approximately 2000 pages, and the margins are very tiny, so don’t expect to make many notes in this Bible. That’s not a deal-breaker for me, as I do not make notes in my Bible. Lastly, there are not one, but two ribbon markers. I assume for both testaments, but if not that is how I plan to use mine. Overall, I am greatly impressed with this edition of the Bible. Normally, if a book is that impressive, I would say that it deserves a place on your bookshelf. The Didache Bible, however, deserves a spot on your desk, dining room table, coffee table, or wherever you read your Bible. It will not be replacing my Ignatius Catholic Study Bible, but I will be using the two in conjunction. This is the complete Catholic Study Bible that Catholics have been awaiting for at least a decade. The only thing I found odd about it was that 1st and 2nd Maccabees were at the end of the Old Testament, instead of between the books of Esther and Job. So either pick up a copy of the hardcover now, or if you insist on leather, wait a little bit longer for that one to be released. I would content that we’ve had as good as can be hoped for in the New Jerome Bible Commentary for quite some time now. I would encourage anyone, and everyone, to look towards that if they want to know where Catholic scholarship stands on Scripture and a full elucidation given what we know about the Bible today.